Below is a list of all the book reviews I have done on the blog. Baxter, Benjamin J. In the Original Text It Says. Gonzalez: Energion Publications, 2012. Black, David Alan. Learn to Read New Testament Greek. Nashville: B&H, 2009. Campbell, Constantine. Basics of Verbal Aspect in Biblical Greek. Grand Rapids: Zondervan, 2008. Culp, A.J. Puzzling Portraits. Eugene: Wipf and Stock, 2013. Elliot, Mark W., Scott J. Hafemann, N.T. Wright, and John Frederick. Galatians and Christian Theology. Grand Rapids: Baker Academic, 2014. Erickson, Richard J. A Beginners Guide to New Testament Exegesis. Downers Grove: InterVarsity, 2005. Guthrie, George H. and J. Scott Duvall. Biblical Greek Exegesis. Grand Rapids: Zondervan, 1998. Lamerson, Samuel. English Grammar to Ace New Testament Greek. Grand Rapids: Zondervan, 2004. Marshall, Colin and Tony Payne. The Trellis and the Vine. Kingsford: Matthias Media, 2009. Mounce, William. A Graded Reader of Biblical Greek. Grand Rapids: Zondervan, 1996. Platt, Richard. As One Devil to Another. Tyndale, 2012. Sheridan, Mark. 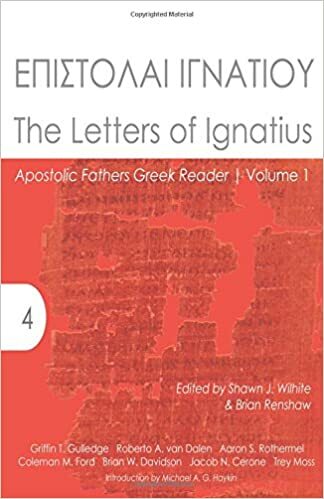 Language for God in Patristic Tradition. Downers Grove:IVP 2015. Trenchard, William C. English Grammar to Ace New Testament Greek. Grand Rapids: Zondervan, 1998. Windham, Neal. New Testament Greek for Preachers and Teachers. Lanham: University Press of America, 1991. Wright, N. T. A Case for the Psalms. Harper Collins, 2013. Wright, N. T., Mark W. Elliot, Scott J. Hafemann, and John Fredrick, eds. Galatians and Christian Theology. Grand Rapids: Baker Academic, 2014.